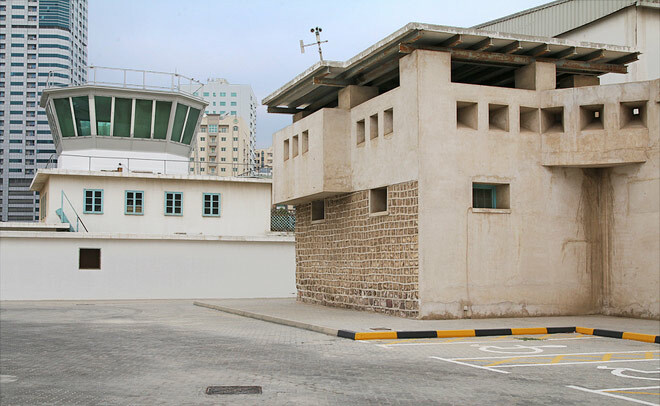 The Al Mahatta Museum is located on the Immigration road, behind the Immigration office building in Sharjah, at the corner of King Abdul Aziz Street and Al Estiqlal Street. In 1932 the British company Imperial Airways asked Sharjah’s ruler, Sheikh Sultan Bin Saqr, for permission for its planes to stop there on their way from Britain to India. An area of salt flats - at the time well outside the town - was rolled smooth to make a short runway. Today it is part of the busy King Abdul Aziz Street. Sheikh Sultan Bin Saqr built a rest house, known as The Fort, to accommodate the crew and passengers for the overnight stop. The first stopover in Sharjah of a passenger flight from London's Croydon airport to India was on the 5th October 1932. Imperial Airways extended the route to Australia in 1934. Each week, a four-propeller Handley Page biplane stopped overnight at Sharjah. As the twentieth century advanced, Sharjah grew in importance. The airport grew in size, employing Sharjah people and helping the local economy. In 1940 the British Royal Air Force built its own facilities adjacent to The Fort and extended the runway. From 1950 on, the fort was used as the headquarters of the Trucial Oman Scouts, who policed the area between Saudi Arabia and Oman. In the 1960s, a new terminal was built, and the airport became a base for training pilots. The site of Al Mahatta is an outstanding example of a contemporary 20th century fortress that uses local traditional construction techniques and materials. This combination of modern style military architecture and local construction makes it unique. The original 1932 building was designed around a single courtyard, with all the doors and windows facing inwards, only small high-level windows faced outwards. Two distinctive watchtowers sat on diagonal corners of the building to allow for surveillance and to defend the building if required. It is sometimes referred to as 'The Fort'. The first courtyard is the original building. It was extended soon after completion to provide more accommodation and protection for international passengers. In 1956, a new Control Tower was opened, which operated up until the new Sharjah International Airport opened in 1977. After this time, the buildings were used less and less, and by the mid 1990’s was in a state of disrepair. In 1998, following restoration, the Al Mahatta Flight Museum was opened, and in March 2000, the Sheikh Sultan Bin Saqr’s old fort, together with the hangar and control tower, was inaugurated by H.H.Sheikh Dr.Sultan bin Mohammed Al Qasimi, Member of the Supreme Council and Ruler of Sharjah, as the Al Mahatta Museum. Sharjah Air Station. Between East and West.